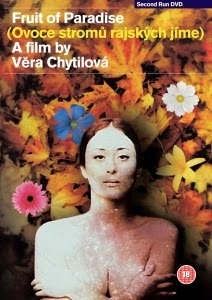 A lapsarian search for truth sits at the heart of Vera Chytilová’s avant garde masterpiece Fruit of Paradise (1970), but meaning is itself something that must be discovered by its audience. This was the last film that Chytilová made before she endured a seven year ban from filmmaking imposed by the Soviet government ruling Czechoslovakia at the time. Although her worked remained provocative for decades afterwards, when she returned behind the camera for 1977’s The Apple Game her audacious formal experimentation was considerably less evident, making Fruit of Paradise a remarkable departing line in the first act of her career. Not that such narrative conventions were of any interest to her. Much like her previous and most famous, film Daisies (1966), the concept of storytelling in the traditional sense is a loose one. Chytilová was once quoted as saying that cinema is “not about being original at any cost. It’s about finding a stronger way to express your thought.” In this instance, she manages to be both strikingly original and unequivocally forceful, even if the imperative to coalesce what her thought might be is left with her viewer. The aforementioned quest for truth is certainly a major component of that, intertwined allegorically with Adam and Eve and the temptation of the devil and thus their journey to self-comprehension, and their subsequent fall from the garden. That story is overtly relayed in the film’s sensational opening which begins with painted titles decked with floral flourishes and Zdenek Liska’s score. From there begins an eight minute sequence which could be a timeless masterpiece of short film on its own merit. It’s a palimpsest of imagery, with various patterns of fauna and organic matter laid over one another to comprise the ever-shifting canvas for a translucent Adam and Eve to wander through the Garden of Eden. It’s virtuoso cinema in which a choral narration is incredibly complemented by the cinematography of Jaroslav Kucera and the utterly captivating vision of Chytilová. From there begins the primary focus of the film which circles around the entanglements of Eva (Jitka Novákova), Josef (Karel Novak) and the sinfully enticing Robert (Jan Schmid). Remaining outside of time of place, events follow Eva’s growing infatuation with Robert and her following discovery, perhaps, that he is responsible for a series of murders. There are various themes undoubtedly at play within this, not least Eva’s sexual curiosity with the enigmatic Robert, dressed in red. Whereas Josef, her husband dressed in grey, could be argued to represent the compromised norm of a oppressive society, Robert perhaps symbolises the ultimate danger of such transgressive explorations. Fruit of Paradise is ultimately a starkly pessimistic work; a monumental visual and philosophical odyssey that is bewitching from first frame to last.